For Eyes, and For Ears. Gosh, I shouldn't say this but 'Geeky' Danny Gokey has the package. He was the best of the night [Danny Gokey - Hero by Mariah Carey]. 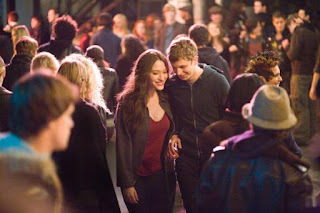 Okay, yesterday I watched Nick and Norah's Infinite Playlist. I LOVE the movie. This is about chasing a love through streets of New York. I enjoyed it so much because it involves advanture, comedy, stupidities, musics, instant-fall-in-love with good reasons, heartbreak, a slutty girlfriend versus a better crush, passive-aggressive boy, and happy boys *the subsidiary characters I mean* kickass! But I heard the book is annoying and kinda trashy. I'm starting to think that passive-aggressive guy like Paulie Bleeker and Nick is turn me on.